The fact is that most of us will unexpectedly fall at some point in our lives. You can protect yourself by learning how to roll and fall safely. At Open Door Jujitsu, you can learn this in two ways. 1. 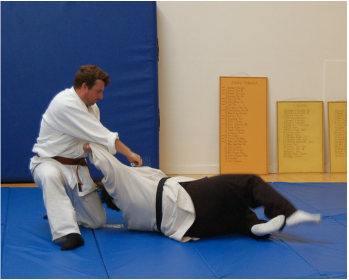 Come in to our regular jujitsu class and learn to roll and fall. You don't have to learn jujitsu to learn this skill. 2. Take our safe rolling & falling class. This class is taught in either five (5) or ten (10) 90-minute sessions on consecutive weeks. In the longer class, t's fine to miss a couple of classes, as you will have many opportunities to practice. Make-ups available by attending regular jujitsu class. Class fee is $100 (5 classes) or $200 (ten classes) per student (no one turned away for lack of funds). If you have a group of 5 to 7 people who'd like to take this class, contact Sensei Lisa and we can schedule a class for your group. First, we don't do this in the safe rolling & falling class! 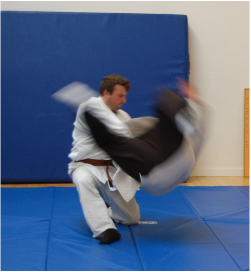 The photos show an advanced throw and fall and illustrate why we spend so much time in jujitsu class learning how to roll and fall safely. 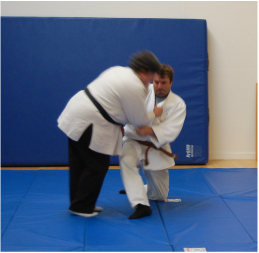 Sensei Lisa is about to go over Rob's outstretched leg. She's in the air and positioned for a good fall. She's already started her slap (we slap the mat when we fall). Sensei Lisa is safely on the ground.